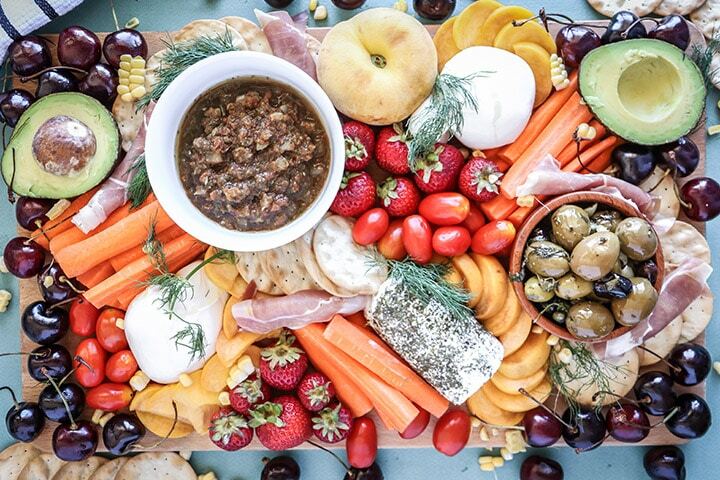 An easy summer crudite platter with sliced veggies, seasonal fruit, creamy cheeses and fresh herbs. Basically summer on a plate! Cheeseboards, platters and assortment trays make my life. If I sit down to a restaurant and see an antipasto tray on the menu, you can bet I’m ordering it. Maybe it’s my deep desire to try all. the. things mixed with a bit of FOMO (or “fear of missing out”), but the more foods I can taste in one sitting the happier I am. 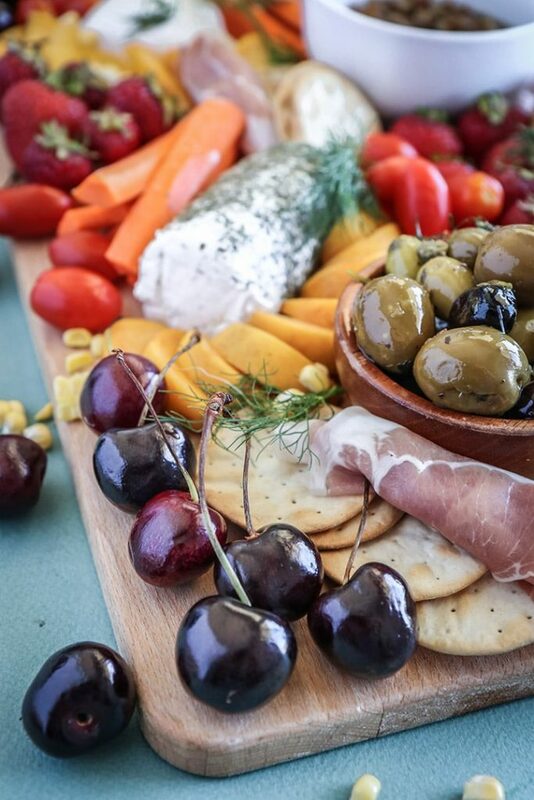 One of my favorite easy weeknight meals is to put fresh vegetables and fruits on a tray with whatever cheese I have on hand, fresh bread or chips and call it dinner. Platters are the perfect “let’s eat everything in this house before it goes bad” dinner. 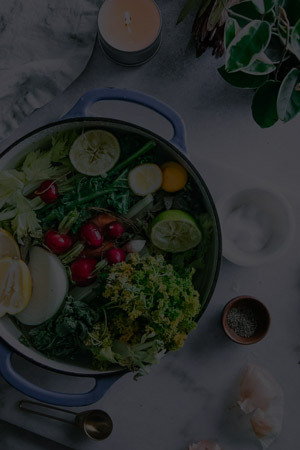 Not only are you able to try a little of everything, but you’re also reduce food you might have wasted. Win, win! 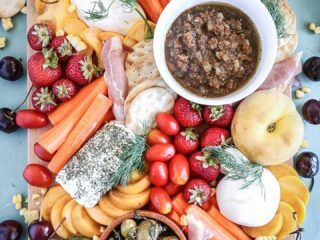 How to build the perfect summer crudite platter. 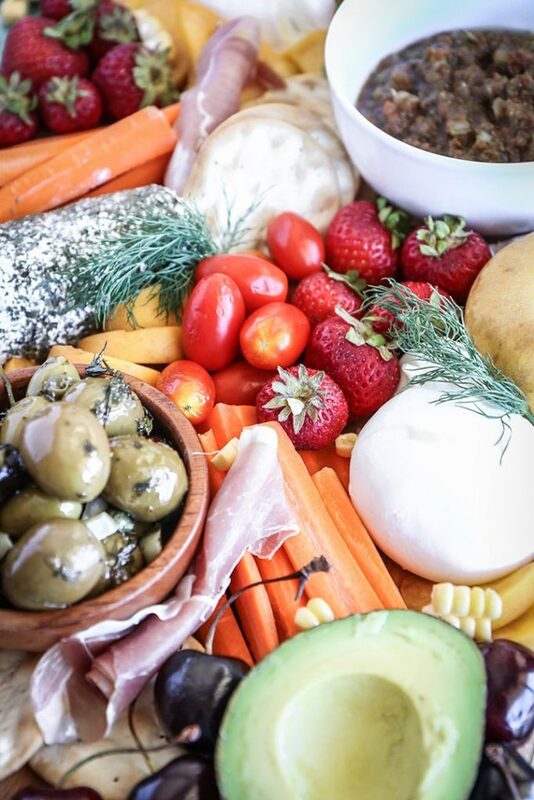 Fresh, seasonal vegetables and fruit: fresh fruit and veggies are the foundation of crudite platters and buying in-season is the best way to ensure great taste – and great price! In-season produce is not only more flavorful, but it is also cheaper. 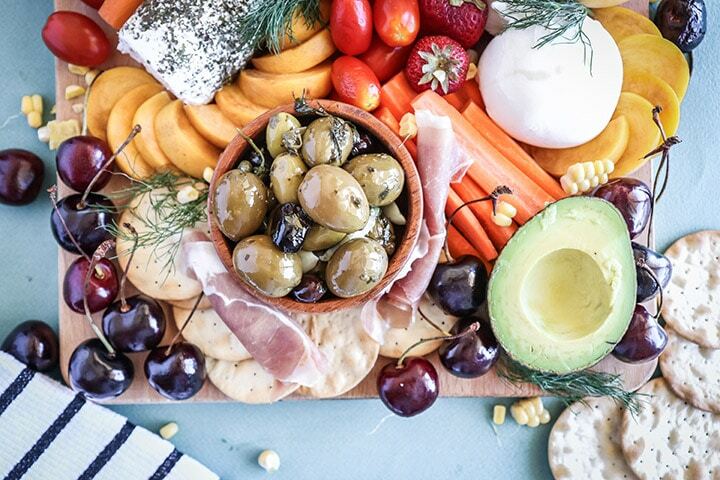 So stock up on seasonal, cheap veggies for your wine and cheese platter nights! Cheeses, sauces and dips: They don’t call it a spread for nothing! While fresh produce is great on its own, it’s best when used as a vehicle for a spread, dip or cheese. Try a soft, spreadable cheese for dipping veggies or a salsa or hummus if you’re going vegan. Seasonal Extras: Fresh herbs, cuts of charcuterie and even fresh edible flowers make great additions to your vegetable tray or spread. Or try a side of olives, like my Warm Marinated Olives recipe. These extras are not only delicious byt they add a bit of beauty to an otherwise boring vegetable tray. No platter dish? No problem. 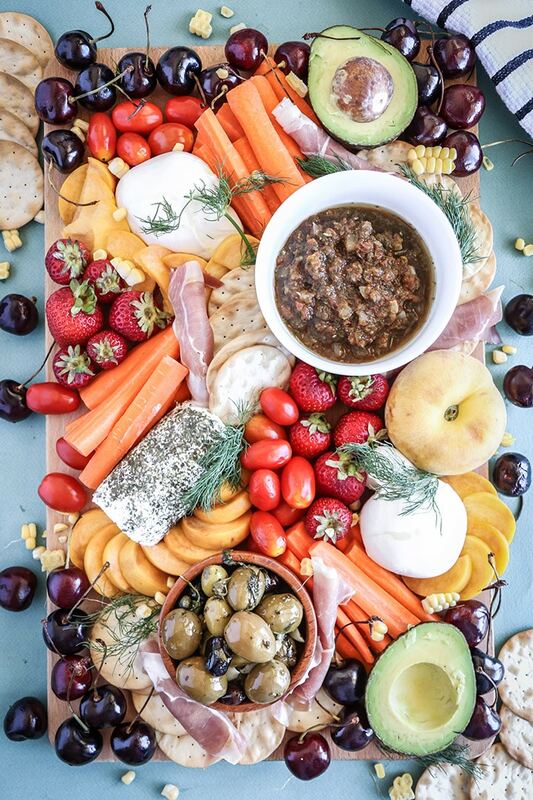 You don’t have to have a fancy serving dish to make a vegetable platter look gorgeous, a simple large plate, cutting board or even a cookie sheet will do the trick. However, if you’re transporting a tray to a party or looking for a few trays in general that will help you build better platters try out this set of three or this large serving tray. I have a few that are similar and I use them often for both platters and also when serving large salads or side dishes. Arrange all ingredients on a cutting board or tray. They don’t have to look pretty, they will still taste good! Enjoy with a glass of wine and a good friend! Make it vegan! Replace the cheeses with dips like hummus and the prosciutto with tofu or tempeh sausage to make it vegan. Breakfast + BrunchSmoked Salmon Bagels: Brunch for Dinner!